Arnott and Vederoff Ancestors - Aaron and Esther (Sakkar) Vederoff and their oldest son Morris. Photo was taken in Siberia in about 1909-1910. Aaron and Esther (Sakkar) Vederoff and their oldest son Morris. 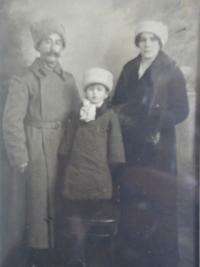 Photo was taken in Siberia in about 1909-1910.